Conditioning muzzles are perfect for teaching your dog to wear a muzzle. A larger hole at the front of the muzzle allows treats to be given to the dog. The JAFCO Muzzles are a tried and true plastic basket muzzle that offers a great deal of security. Many K9 departments around the world use this muzzle for training protection dogs in muzzle work. They are easy to put on and easy to take off, even easier than most muzzles. If you are looking for a good utility muzzle that will last for years and years, this is your best choice. All are made with polyethylene plastic with two reinforced rubber straps. The clear plastic muzzle is softer and more flexible than the white or black style plastic muzzles. These muzzles are not designed for muzzle fighting training. Dogs can drink with the muzzle on, using a water bowl or bucket. It is best to "teach" your dog that it is ok to put the muzzle into the water before leaving the dog unattended for any period of time. Conditioning muzzles have a large hole in the front so that the trainer can deliver treats. Positive reinforcement will help dogs adjust to wearing muzzles. 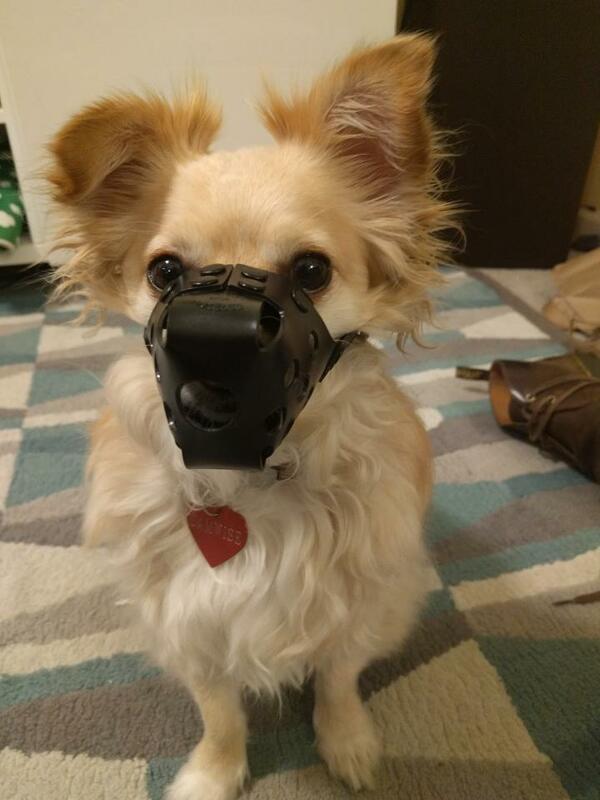 After a dog has been properly trained to wear a muzzle, we recommend switching over to a regular JAFCO Muzzle. If at some point the muzzle comes off, it’s either too loose or too big. The muzzle should fit comfortably and allow the dog to pant and bark. For help in learning how to size your dog for a JAFCO plastic muzzle, we have an instructional video here and a written article here that go into greater detail. If you are still unsure of the size to choose, measure your dog then call our office at (715) 235-6502 and we will do our best to help you decide the best style and size of muzzle for your dog. The muzzle cannot be longer than your dog’s actual "nose length". If the muzzle is longer than your dog's nose length, the muzzle will be in the dog's line of vision. The muzzle's circumference must be larger than your dog's "nose circumference." We recommend between one and three inches larger than your dog's measurement. If the muzzle is the exact same size as your dog's nose, the dog won't be able to pant. It is very important that you give your dog enough room to pant while wearing the muzzle. This fits my Chihuahua mix perfectly! He is around 13lbs. We got a black size 0. This is a brilliant muzzle and I've recommended it to trainers here in Australia. It took only a few short and relaxed sessions for my dog to wear it happily. Although well trained, he is reactive in some situations, and the muzzle allows him a lot more freedom to go out with us. It will also be useful for vet visits. We got the clear version - it's so quick and easy to put on and off, so comfortable for the dog and I wouldn't use any other type of muzzle. Brilliant design (I bought the two strap version), excellent quality, so simple and quick to fit. With the treat hole, it took less than hour for my large GSD boy to wear it happily. Plenty of ventilation, comfortable padding across his nose and he can pant, drink, take treats, anything other than bite. I now can let him run free on the beach or take him to the vet without having to worry about public liability. Would recommend to any responsible dog owner. I just wanted to thank you for the outstanding service and the videos expelling on how to fit the correct size was 100%. I bought a size 4 but I sized it wrong because I used a shoe lass.But I'm keeping the the 4 because the other video on baiting your dog works perfect and that's why I'm keeping it. Keep in mind, if you buy the wrong size your dog will be blinded. And before you use the muzzle, make sure you watch how to bait your dog the correct way. I recommend buying the "Meat Barn Meet Rolls." I bought 6 of them and I cut them up just like the video explained. I've been a Leerburg customer about 2 years and will only buy from the best.